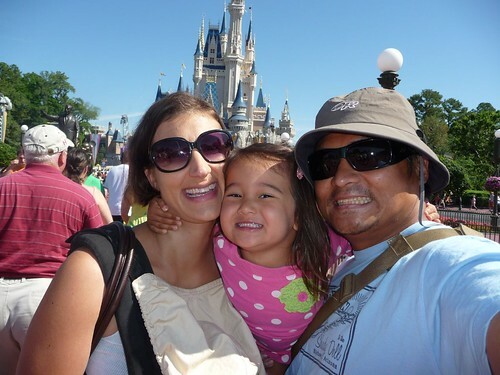 Mali Mish – Day 73: The Magic Kingdom. If you can’t tell by the smile on Ava’s face, today was THE day. The day we go to the Magic Kingdom! We woke and bright and early and headed to the dock. Not only does our Disney campground offer free buses all around Disney World, it also has boats too. In case you didn’t know, Florida is full of water. Don’t tell anyone, but I think Florida is slowly sinking into the ocean. Shhhh. And everyone thinks California will eventually end up under water! Sorry Arizona. After a 10 minute boat ride, we were finally here. The Magic Kingdom! According to Wikipedia, The Magic Kingdom was initially built similarly to the existing Disneyland in California, however the Magic Kingdom was built on a larger area. But if you ask Dan or me, it felt so much smaller. Not sure why. And it had lots of rides “missing”. Like the Matterhorn, Circus Train, Mr. Toad’s Wild Ride, Storybook Land Canal Boats, Indiana Jones and no restaurant inside of Pirates of the Caribbean! The interesting thing about this place is that in order to have the secret underground tunnels for the characters to move around the park, they needed to be built above ground becasue of Florida’s high water table (a.k.a sinking!). So the park actually sits on the second story. This place also had lots of things under construction. Like Ariel’s Grotto. One of the things Ava was most looking forward too. And for obvious weather reasons, lots of the rides and lines were all indoors. And it sorta took away from the “magic” of the place. For us. Not Ava. As soon as we walked to the center of the Magic Kingdom and began our descent into the many lands here, a show began at Cinderella’s castle as if it was waiting for us to get there. First stop of the day was Fantasyland. And Ava’s first ride choice? Snow White’s Scary Adventure. Ummm, wrong choice. As you can tell by her face. Stop smiling Dan! Next ride choice was mine. Hmmm, my favorite ride looks a bit different on the East Coast. I know. I know. I shouldn’t compare but look at this. This is no It’s a Small World. This is It’s a Super Tiny World. Like I was saying before, the line part of the rides are moved indoors here and it just doesn’t have that same magic behind it. I can’t be the only one that thinks so, right? 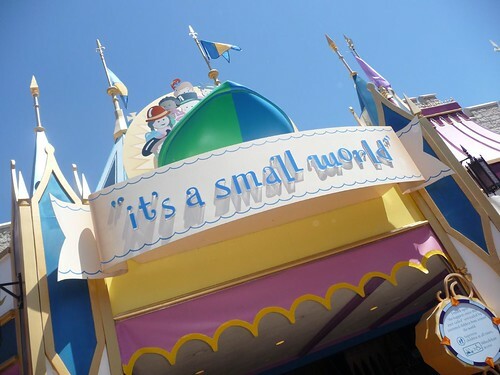 Come on, Small World fans!!!! 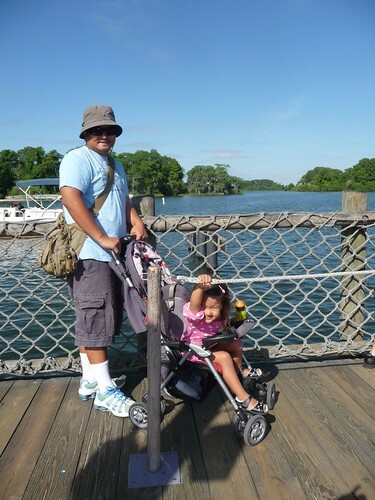 You might be wondering what our infant is doing while we are on all of these rides? She is right there with us. In her baby carrier, of course. But Mama Marlene isn’t loving the carrier today. The heat and the humidity are making the carrier and body heat unbearable, so we have to take lots and lots of breaks. 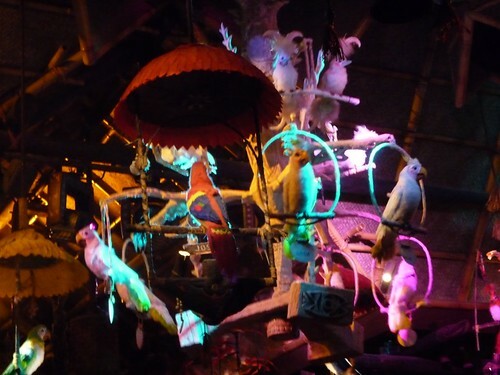 And one of those breaks was the Tiki Room. A cute part of Disney that I never knew existed until last year. And how did Mila like it? She giggled at all the birds just like she does with dogs and our cat, Yoda. Next stop, Aladdin’s Flying Carpets. 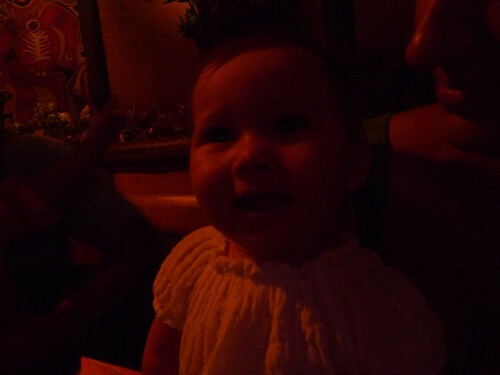 Ava loved it. She was dying to go on Dumbo all day today but the line was ridiculous. So we rode on this thing twice. 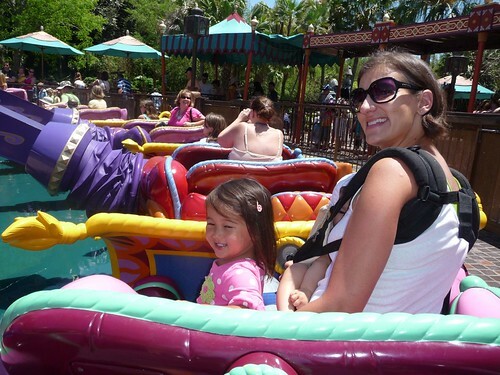 She was more than happy with this Dumbo copy-cat ride… for now. Baby carrier break time again. Hello Jungle Cruise. 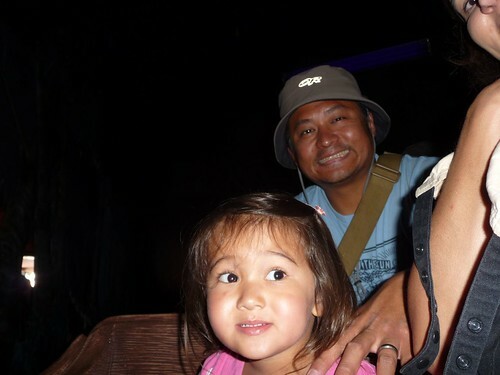 The last time Ava was on this ride at Disneyland, the piranhas at the end of the ride freaked her out. So we prepped her this time for them. And you know what? 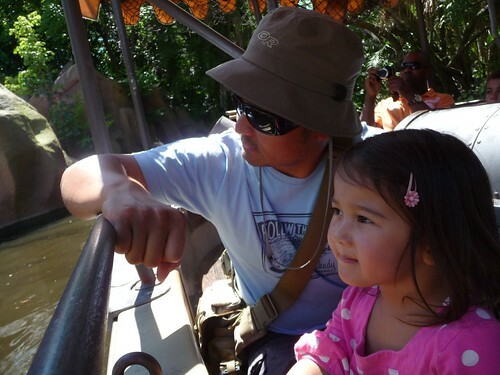 No piranhas appeared in Florida’s Jungle Cruise. Hmmmm. 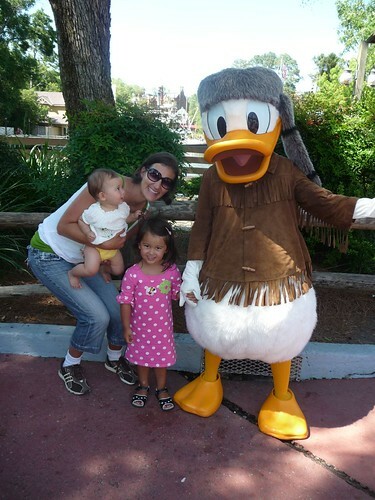 Once we got a lot of the rides under our belts, it was time to meet the characters. 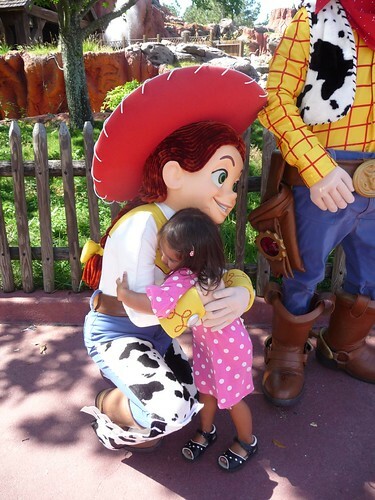 Ava hugged each character we met and posed for a picture. And Mila? She just stared at them instead of the camera. Ava wore her special “Minnie Mouse” dress today for you know who. 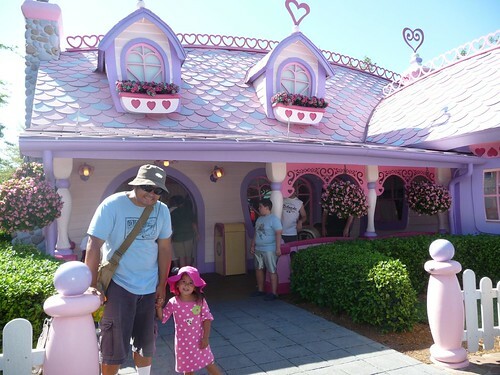 Here we are in front of Minnie’s House. She was so excited to catch Minnie watching TV or baking some muffins but there was no Minnie in sight. 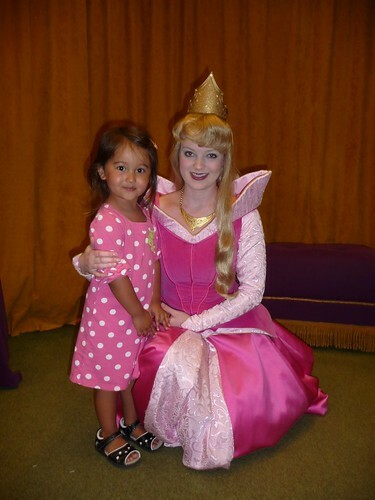 So we went next door and stood in the longest line of the day to meet some princesses. And thanks to them, a Minne Mouse disaster was diverted. Yes, we’re awesome. 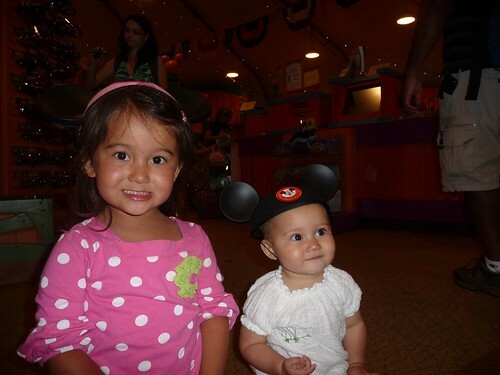 One of our last stops of the day was the gift shop to get the girls their very first pair of mouse ears. With their names embroidered on the back, of course. But I totally forgot to take a picture of it. What kind of blogger am I today?!?!?!?! A worn out one. 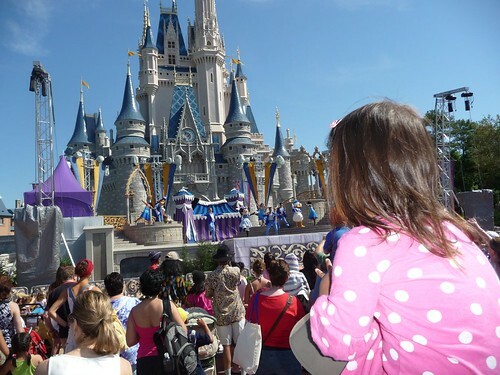 Maybe the Magic Kingdom IS bigger than Disneyland after all. My poor feet!!!! And you know what else? We have a 2nd day pass and get to do this all over again tomorrow… if my poor feet let me. 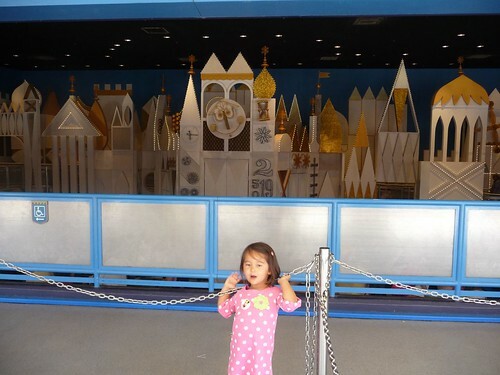 One Response to Day 73: The Magic Kingdom. Looks like lots of fun but, I agree Marlene!! 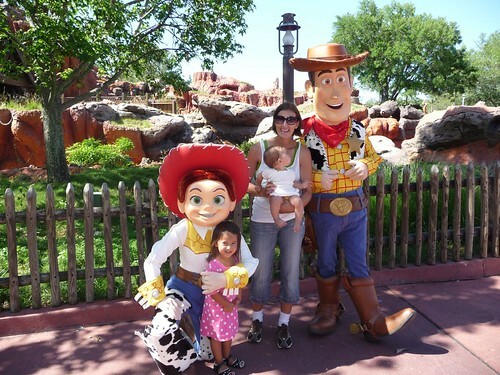 There is only ONE Disneyland, the original with all the magic, and we have it in the heartland of California. Love your all pictures! !